It is no secret that i am out of shape and this weekend gone certainly confirmed it. Friday night at the Indy saw me just scrape what i would class as par but then a Saturday afternoon in the wall at work saw me dramatically under-performing. What was significant was why i was under-performing. At the Indy, i did feel weak and wasn’t shy in exclaiming such. Tim heard it from his captive position behind the counter (sorry dude) and Em certainly got it once i got home: “I’m old, weak, fat and ugly”. I repeated this, much as i have been for a few weeks now but perhaps i was saying it a bit too much; over-compensating? making excuses? Who exactly was i trying to convince? At the Brenin, i struggled badly. Climbs that i should be able to walk up spat me off. Indeed, climbs that i set threw me. After failing on a trunk-route 7a, i opted to change tact and try a bit of campus movement. A yellow route would suffice, nice easy jugs, certainly doable. The first move didn’t exactly turn into a campus move. I’d got a right foot on to get going, the starting jugs being a bit low, but as i tried the move, my foot stayed pinned to the hold. Odd, i should’ve cut loose. Oh well, carry on, campus the next few moves, up to the penultimate hold. Matched, as the last move is far, i pulled up and didn’t even throw a hand in it’s direction, i just came back down to the ground. Now this is odd: it is not common for me not to commit to a move, certainly not indoors and CERTAINLY not on a route like this. I didn’t even try the move! I eyed it up, decided it was too far before i’d even tried, did a token gesture and came back down. This is not normal. Was it a fear of failure? Don’t try, don’t fail, don’t look so stupid? And then it hit me, an epiphany that slapped me in the face harder than the ground when i jumped off: i’ve slipped down the DCBA Scale and i’ve managed to convince MYSELF that i’m not strong enough. I’ve actually managed to talk myself out of being able to do anything. There are Four Facets of Rock Climbing Performance: Technique, Strength and Conditioning, Tactics and Mentality. These are the four areas that encompass all climbing performance and any area of weakness can be traced back to at least one of these Facets. What i’d suddenly realised was that where i thought the problem was (S&C) had actually shifted without my realising and now manifested itself in a problem with my Mentality. That didn’t mean i was suddenly stronger than before but it meant there were more problems too. I kept on with the analysis and realised i’d talked myself into having problems with ALL of the Facets. I wasn’t really trying and when i was, i was trying the wrong things at the wrong time and lacked the necessary structure. Even my technique was failing as my mind continually worried i couldn’t hold on – ironically putting more pressure on the muscles that weren’t up to it in the first place! It was a vicious cycle. But suddenly, with this epiphany, the cycle had been broken. In that instant, the problem had shifted significantly. I could still feel the pain and the ache in my body so i knew the S&C issues were still there but now i understood the problem, i could begin to address it. For a while i’d been suggesting my next move is mileage on the wall and now it is even more true. I can’t afford to wait for the start of the winter aggregate, training starts now. And it needs to be much more purposeful. 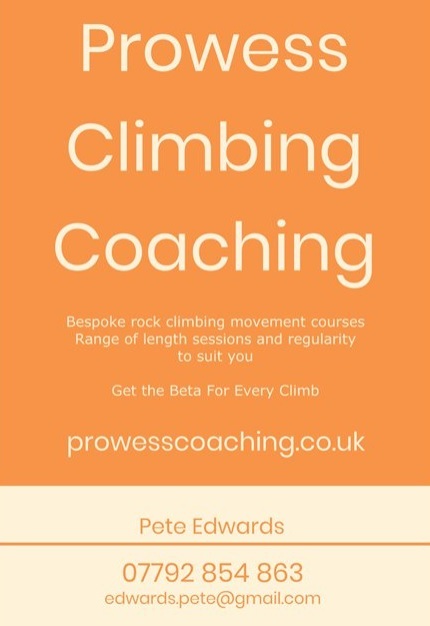 The one bright side to this is it could help my career and demonstrates wonderfully the need both for coaching in rock climbing and self-assessment and self-coaching. It has also given me a nice little case study to help cement the theories i’ve been working on over the last few months. I am now fully immersed in my Masters degree; a Professional Masters in Elite Performance with the University of Central Lancashire. Basically i’m looking at coaching in rock climbing and as such, at the moment i’m reading loads about the Adventure Sports Coach. It seems this is a new role in the outdoor industry and is facing some opposition. Certainly, the coaching qualifications with the Mountain Training Association faced some mild backlash as many of the old guard failed to see the need for formalised coaching in rock climbing. While this is one isolated incident, it demonstrated to me at least that there really is a need for a coach, and an educated and reflective one, in this sport; competitive or otherwise. Something had twigged in my head. I hit the ground and swore very loudly, thankfully in an empty room. The realisation that my mentality or worse, my technique may not be at their best had got under my skin and pissed me off. I’ve always prided myself on these two aspects of my climbing and the idea that they weren’t working properly got me angry. I caught a glimpse of my reflection and there i was: clenched jaw, furrowed brow, there was fire in my belly again. The hunched body language of earlier was gone, now i was up for a fight. I walked back over to the yellow and tried again. First move, second move a big squeeze and i could feel my shoulders tensing as i felt better about myself. Carry on, move after move, giving my all. I’d done it, i’d changed that mindset and i’d completed it. All bar the last move. I was too tired. After our Font fun, it was back to work and nose to the grindstone. Almost literally, to be honest! Does anyone else find that the stress of coming back in to work and dealing with everything that happened while you were off almost negates the whole break in the first place? Nevertheless, it only lasted a week as the Thursday after we returned, Em headed to the Midlands for a gig and i was left with a few days to myself. These days, that means one simple thing: climbing. From Thursday morning until she returned, there was only one period when i wasn’t either working, coaching or climbing and that was a rest period when i went to visit my parents! My usual coaching session was shifted from Friday to Thursday, possibly due to it being Good Friday, and whenever it moves, the numbers are low. As such, i had a session working with my friend Rob on how to coach, rather than actually coaching myself – an unusual take on things and a good demonstration of my progression. I must admit, it’s quite nice to be doing well with it and being respected for it! The downside: i brought Tess in for the last little while, the wall being very quiet, and somehow, unbeknownst to me, she managed to hurt her elbow and develop a limp. Not uncommon but certainly not ideal. She has now recovered but as with anyone, it was slow. Friday, now free, was miraculously dry. Making the most of the lack of necessary doggy freedom and with time still being in short supply before the onset of darkness, the Cromlech boulders came calling and i decided to finally go and check out Sleep Deprivation 7b for the first time since i found out where it actually starts. Turns out it’s still not much easier, was soggy and full of touristy rubbish underneath and didn’t float my boat. That was after i’d repeated the usual problems on the roadside face, and shown Alice from work some good ticks for herself. I think she surprised herself with some of her ascents and while i sat under the roof wondering what to do with myself, she scampered over some nice easy routes with Harry, her boyfriend. Eventually, i realised that actually, i’ve never actually given Leo’s Dyno 7a+ a real effort so why not now! Saturday night was my rest night, seeing my parents and some visiting friends and generally allowing my skin and body to recover but Sunday morning arrived, with my trusty canine companion still being a limpy lump and the weather was almost perfect. Being so far away, heading all the way from Caernarfon to the Ogwen valley was a risky business but that was the project i wanted to attack. In a recent post, i mentioned Gallt yr Ogof as a potential for some success and this was exactly the place that had piqued my interest. But that still left me with 25 miles to drive to get there. It took me a few days to realise that this was what had put me in a foul mood to begin with but nevertheless, my day didn’t begin well. I called in at our house – still under a layer of plaster dust following some building work – to try in vain to find my bouldering guide, furthering pushing me into a deep grump. Then to top it all off, i drove over the pass on a Bank Holiday Sunday in typically slow traffic. I quickly pulled in to the Brenin and ran into stores to grab a replacement guide, but not before slipping under the canopy in front of a large group of clients and wrapping myself around the concrete stanchion in the corner. All this began to clear as i pulled in to the campsite and unpacked my kit and by the time i made it to the crag, it had all been replaced by a sense of excitement. It had been a long time since i’d had conditions and opportunity this good and psyche levels were getting high. To it’s right, though, the one problem i had borne in mind turned out to be truly nails. Smackhead goes at 7b (i think, still don’t have my guidebook!) and is only a couple of hard moves, right at the start. I couldn’t pull off the floor; and even when i skipped the first move, the position was so stupidly hard to hold, i decided to wander around the corner and check out some of the other problems. And here we find Regeneration 7b: the most apt title for not only the ascent but the timing too. The first period of climbing in the New Year – a typical time for nature to begin to regenerate. A marker for me to try to claw back some form and begin to improve again. A nod towards the lovely little reason that’s so hard to do. Holding the first position was certainly the toughest part for me, the second move needing precision that took time to find but after that, it was dynamic moves on reasonable crimps and a precise foothold. It was like it was set just for me and those three moves seemedto regenerate my spirit just in time for the next challenging season ahead.